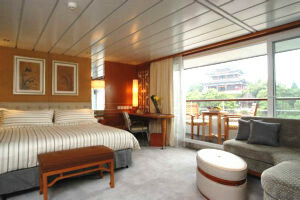 ORC offers the ultimate in luxury when cruising on the Yangtze River, the world's third longest river (at 6,280km / 3,900miles) and the symbolic lifeline of China. The magnificent Three Gorges region frames a cruise that is unsurpassed in sheer physical beauty, with draws on over 3,000 years of cultural history. During the Three Kingdoms Period (260-280AD), the gorges played an important role in the course of China’s history. Through World War II, the gorges provided protection against the onslaught of the Japanese invasion. In recent years, the Three Gorges have won international attention both for the majestic scenic beauty and the growing concern over the construction of the Three Gorges Dam Project – the largest dam project ever attempted on Earth. Begun in 1992 and slated to be completed (and fully operational) in 2009, the dam – a feat of engineering unprecedented in modern Chinese history – is a great wall for the future. 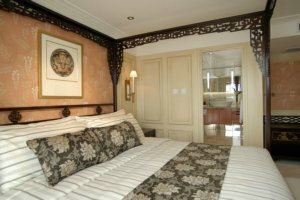 Special discount: Book and prepay full amount before Feb 28, you can save around 10%-25% according to the different season. Get on board at Chongqing Chaotianmen Dock at 17:00. Optional western dinner at 19:00 (CNY 300 per person). Safety briefing at 21:00. Free morning tea and coffee at 6:30. Do Tai chi exercise in the morning at 7:00. Western and Chinese style buffet breakfast is served at the Dynasty Restaurant at 7:30. Western and Chinese style buffet lunch is served at the Dynasty Restaurant at 12:15. There will be a lecture about Chinese Traditional Painting at 13:30. 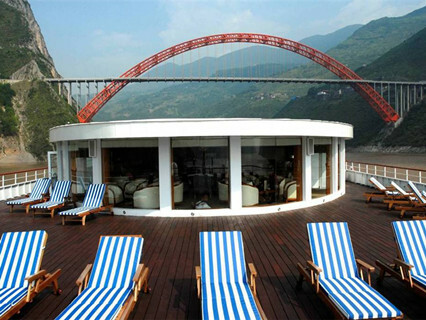 At 15:45, the tour guide will introduce the attractions along the Yangtze River. 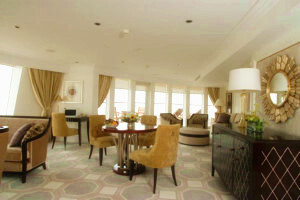 There are other activities available such as a lecture on pearl, free afternoon tea, band performance and tea ceremony. Attend Captain’s Welcome Reception at 17:30– meet with the Captain and other Department heads of the ship. Then have buffet dinner at 18:00. Watch Band plays at Explorer Bar at 21:00. Free morning tea and coffee at 6:30. Do Taichi exercise in the morning at 6:45 am. At 7:00, enter the Qutang Gorge through the majestic two imposing cliffs at the Kui Men gate. 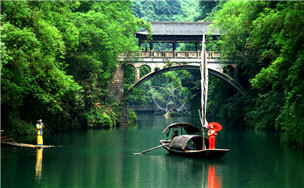 Then comes the Wu Gorge at 8:30, which is known for the 12 famous peaks including the Goddess Peak. Have buffet breakfast at 7:30. Attend a lecture about Silk Embroidery. Shore excursion to Shennong Stream at 10:45. Shennong Stream is a small tributary of the Yangtze River, and its fast-flowing, crystal clear water runs southwards through deep gorges. Disembark from the ship (at Badong) get on board a ferryboat and then be transfer on to a local Sampan poled by Tujia boatmen. On the return ferryboat ride, a local Tujia boat tracker will join and provide an insight into what daily life entails for them, and guests will also get the chance to try on and feel their unique clothing, rain hat, and rain coat. A demonstration of how the Tujia make their special sandals will also take place on board. This interaction with a Tujia Tracker is currently exclusive to the Yangzi Explorer. Picnic Lunch at Tracker's Village. At 16:00pm, the cruise will go through Xiling Gorge – the longest of the Gorges, measuring some 76 kilometers (47 miles) in length. Enjoy the view of the river where the river widens and sweeps through groves of orange and pomelo trees (a variety of citrus related to the grapefruit). 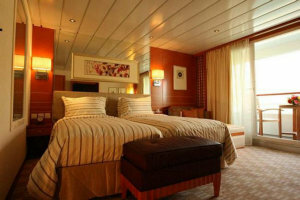 At about 19:00, the cruise will go through five-grade ship lock of the Gorges Dam. At 19:30, attend Farewell Banquet – Enjoy a proper Chinese banquet feast and participate by dressing up along with the crew. Watch the band performance later and enjoy the movie night. Free morning tea and coffee at 6:30. Have buffet breakfast at 7:30. Then collect your luggage. 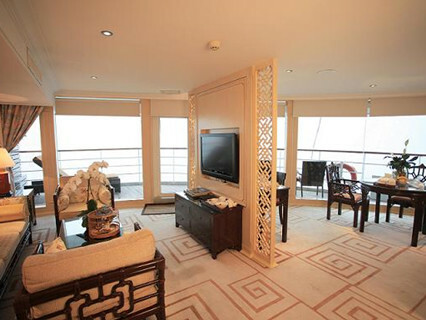 Ship Lift Tour(additional at CNY290pp) followed by Three Gorges Project shore excursion and transfer to Yichang Three Gorges Visitor Center for onward travel arrangements. The itineraries listed in the form probably be adjusted owing to the bad weather, water level, temporary navigation control and prohibition. 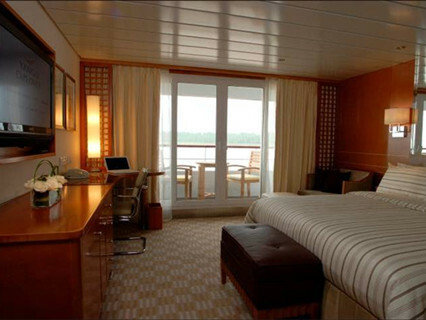 Aboard the cruise: You should arrive at Chongqing before 21:00 PM to aboard the cruise on the first day. You can tell us your flight number (or train number) and arrival time, or hotel you stay in Chongqing. our guide will pick you up and drive you to the port to aboard the ship. 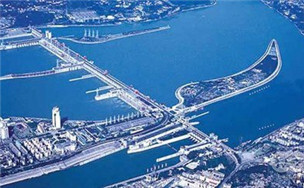 Get on board at Yichang Taohuacun Dock at 17:00. Optional western dinner at 19:00 (CNY 300 per person). Safety briefing at 21:00. Set sail at 6:30. Free morning tea and coffee are available. Do Tai chi exercise in the morning. Western and Chinese style buffet breakfast is served at the Dynasty Restaurant at 7:00. 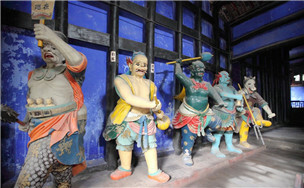 Optional shore excursion to Three Gorges Tribe (CNY 290 per person). Have Western and Chinese style buffet lunch at 12:00. Shore excursion to Three Gorges Dam Site at 13:30. Three Gorges Dam is the largest water conservancy project ever undertaken by man and it has been a dream for several generations of Chinese people. The construction of the dam formally began in 1994. The body of the dam was completed in 2003, and the whole construction will be competed in 2009. It will be 2,335 meters long, 185 meters high, 18 meters wide on the top and 130 meters wide at the bottom. 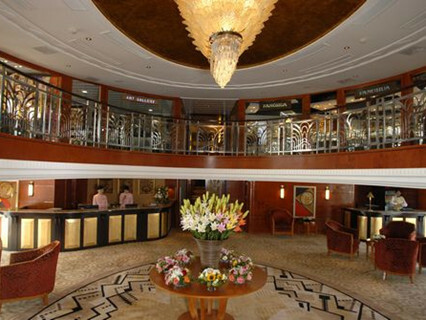 Attend variety activities on the cruise in the afternoon, such as attending the lecture about Traditional Chinese Medicine, watching a band performance and etc. There will be a caption's welcome reception at 18:30 and a la carte welcome dinner at 19:00 – enjoy our wide selection of items from our specially designed a la carte menu by our International Award Winning Chef. 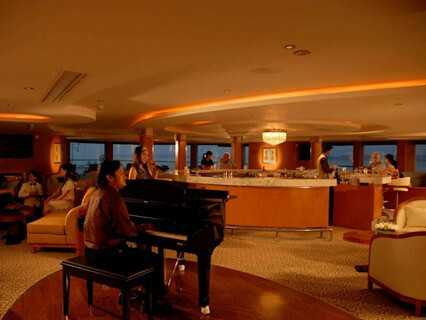 Enjoy the Welcome Crew Cabaret – enjoy an evening of our well-prepared entertainment by our crew member. Free morning tea and coffee are available at 6:30. Do Tai chi exercise in the morning. Western and Chinese style buffet breakfast is served at the Dynasty Restaurant at 7:00. Shore excursion to Shennong Stream at 8:30 - disembark from the ship (at Badong) get on board a ferryboat and then be transfer on to a local Sampan poled by Tujia boatmen. On the return ferryboat ride, a local Tujia boat tracker will join and provide an insight into what daily life entails for them, and guests will also get the chance to try on and feel their unique clothing, rain hat, and rain coat. A demonstration of how the Tujia make their special sandals will also take place on board. This interaction with a Tujia Tracker is currently exclusive to the Yangzi Explorer. 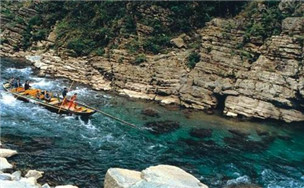 At 13:00, the cruise will go through Wu Gorge, which is known for the 12 famous peaks including the Goddess Peak. 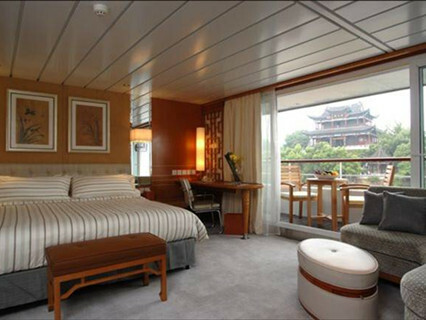 at 15:15, the cruise will enter the Qutang Gorge through the majestic two imposing cliffs at the Kui Men gate. 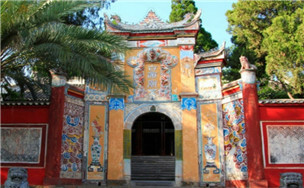 Then there will be an optional tour to White Emperor City(CNY290 per person). Free morning tea and coffee are available at 6:30. Do Tai chi exercise in the morning. Western and Chinese style buffet breakfast is served at the Dynasty Restaurant at 7:30. 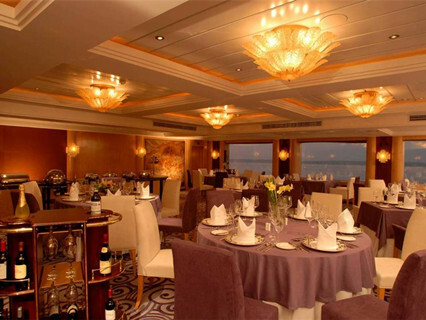 At 19:00, attend Farewell Banquet – Enjoy a proper Chinese banquet feast and participate by dressing up along with the crew. Duo Plays at Exploror Bar in the night. Free morning tea and coffee at 6:30. Have buffet breakfast at 7:30. Disembark at Chongqing Chaotianmen Dock at about 8:30. That's the end of the tour. 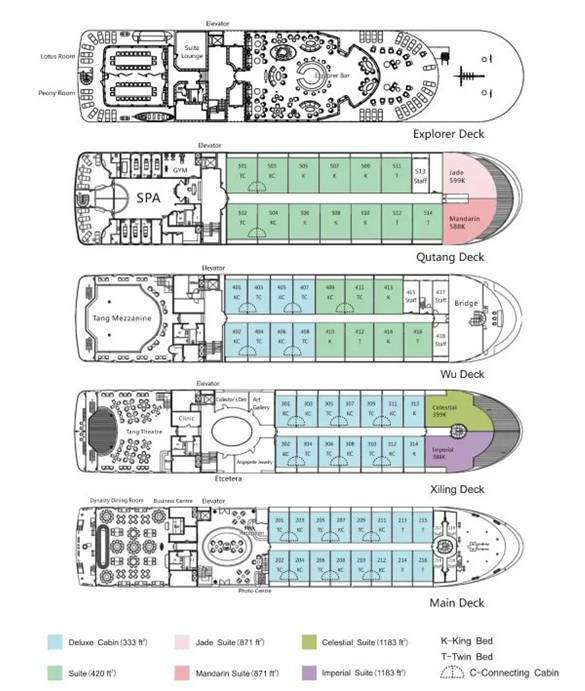 Cruiser accommodations, based on one standard bed per person at basic floor. Shore excursions specified on the itinerary. Tips: CNY150 per person. Note: There are only two beds in a cabin, so if you have 3 persons and want to share one cabin with an extra bed or no sharing for second cabin, you need consider the below policy. 4. If you want to take a whole cabin for the third person, a single supplement of 75% to 100% of a single ticket is required. Reply : Thanks for your inquiry, Can you please tell me each of your nationality first? Looking forward to hearing from you! 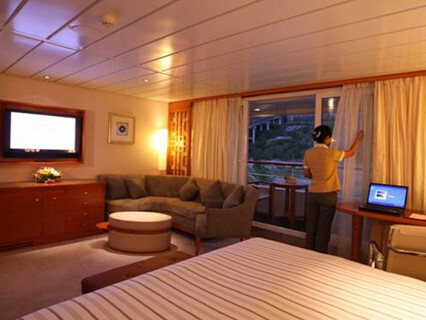 Enquiry : Inquiry about yangtse explorer deluxe cabin, Start from yichang, do you operate at those dates /?